Limestone crushing plant is the mining equipment designed for limestone processing during the crushing process. Limestone is widely used in industries like steel metallurgy, paper making, rubber, plastic, fodder, tooth paste and make up and is one of the most important industry raw materials. ZENT design the high performance limestone crushing plant for limestone crushing solution. Limestone is the important industry and construction raw material, in which it is usually in small size. Limestone is the raw materials of lime, concrete, glass, calcium carbide and can be widely used in steel metallurgy, paper making, rubber, plastic, fodder, tooth paste and make up industry, etc. During limestone crushing process, which is the key step to make full use of limestone, there are three kinds of limestone crushers: primary limestone crusher, secondary limestone crusher and tertiary limestone crusher. Limestone is crushed into small size sand or powder during the process as follow: Limestone stump materials were feeding into primary limestone crusher (usually jaw crusher and impact crusher), in which these stones get crushed into smaller size stones, by vibrating feeder continuously and evenly. Then belt conveyors translate these worked limestones into secondary crusher (usually cone crusher, European jaw crusher and hydraulic impact crusher) and finally get out as sand size limestones. The third step is optional and only some special industry it will happen, like paper making, rubber, plastic, fodder, tooth paste and make up industry, in which limestone sand is produced as tiny as powder. As the leading crushing plant manufacturer in the world, ZENT supply high performance limestone crusher to use in the limestone crushing solution. 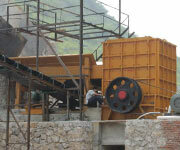 ZENT stone crushers have been proven to be the best selection of limestone crusher. Since the year 1990 ZENT was founded, we were trying to develop new and better crushing equipment. Now ZENT has developed limestone crushers including limestone hammer crusher, limestone mobile jaw crusher, limestone cone crusher and limestone impact crusher. 1. ZENT limestone crusher can effectively handle the large amount of moisture content of materials, to prevent the blockage of the phenomenon of Crusher. 2. Back-breaking not only for soft materials also applies to very large hardness of limestone materials. 3. Limestone Crusher can be easily adjustable and flexible discharge particle size, a wide range of adjustment. 4. ZENT Limestone Crusher provides higher capacity, the best products grain shape, and easy to control, with the greatest reliability and flexibility for the users really create more value.